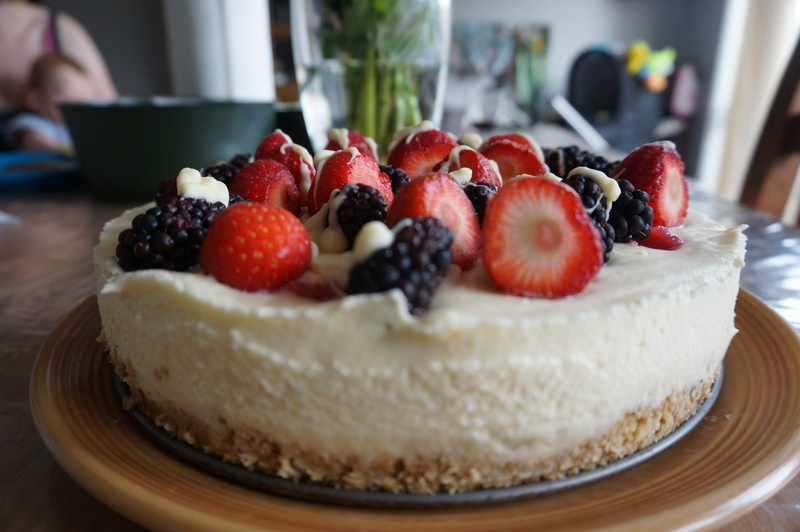 Wanting to make something for our dating anniversary at the end of June, I went for this no-bake cheesecake which didn’t have too many ingredients, so we wouldn’t end up wasting any before we went away for three months. The recipe is from an Annabel Karmel recipe book, and as such I thought it wouldn’t be too difficult. Unfortunately, it’s a pretty ‘stagey’ recipe. I knew that before I started. What I didn’t know was that the recipe tried to make each stage simple – too simple, meaning the amounts weren’t really correct. My first problem was that the recipe uses gelatine. Because hubby is vegetarian, I use vege-gel as a replacement, and, I admit, I don’t get on with that well. I love it when I can use real leaf gelatine, because it’s so easy! With vege-gel, I often seem to end up with clumps of gelatine, and that happened here. The biscuit base was easy – just digestives and butter. That I can do. The next stage was to make a raspberry coulis – a mixture of raspberries, icing sugar and cornflour, which you then heat. This seemed to be working well, until I heated the mixture up together. There was way too much cornflour, meaning it became much, much thicker than intended. At least it did thicken I guess. The problem was, this mixture is meant to be blobbed on top of the cream cheese mixture and then swirled to make a pattern. Whilst blobbing it was easy, it was too thick to swirl. The cream cheese mixture itself was easy to do – just cream cheese, double cream and caster sugar. The problem here was adding the clumpy vege-gel. In the end I had to reheat the vege-gel with some of the cream cheese (I admit, I should have done the vege-gel by itself first…) to get the majority of the lumps out (there were still some). So some of the cream cheese was wetter than it should have been. Finally, I had to put more blobs of the raspberry coulis on top of the cream cheese mixture. This time, I didn’t even try to swirl it. I did cover the whole thing in strawberries and blackberries, with a hint of melted white chocolate, so you couldn’t see that pattern anyway. In the end, the cheesecake, on the whole, tasted fairly good – even if it didn’t look quite as good as it should have. But it was a very faffy recipe for a not brilliant result. I’ve made much better cheesecakes (in terms of taste and looks) with a lot less effort. This isn’t one that will be added to my ‘go-to’ recipes.